Tin Can API arrived to deliver new features to augment the SCORM standard. Tin Can API or Experience API or xAPI (the terms are not used with complete interchangeability but it works for most scenarios) has many compelling features that make it worthy to be looked at. It allows you to deliver and track learning inside a non-browser, non-LMS application. SCORM courses need to work in the same browser setup as the LMS. Tin Can API allows to track a greater set of user interactions and behavior. While SCORM can track user behavior from within the course, Tin Can can potentially do it from a source outside the course as well. Tin Can API can track the data from different LMSs as well. Tin Can API provides a Learning Record Store (LRS) that captures data about individual learners. So we see that Tin Can provides a suite of features that can take SCORM to the next level of maturity. Why do we need an alternative to Tin Can migration then? Today, SCORM cloud reports 132,258 users of their system (https://scorm.com/wp-content/assets/scormstats/stats.php). This number, for just one website that allows uploading of SCORM packages is significant. The number of SCORM packages in use are still large. For all its great features, Tin Can does fall short of being adopted rapidly. The major reason for this is something very guessable. Cost. Since SCORM is so widely used even now, the cost factor for organizations to migrate to something new is difficult to justify. 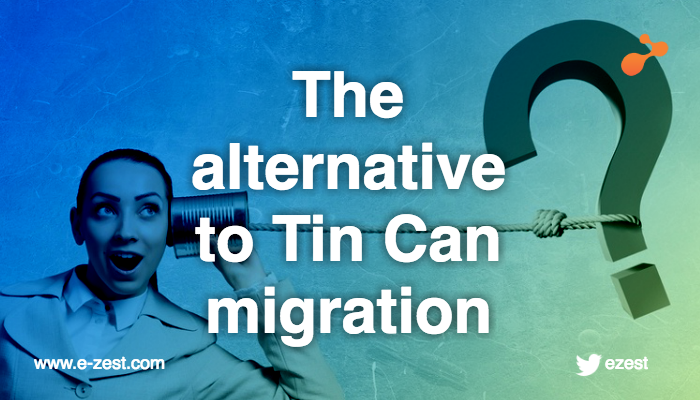 The alternatives to Tin Can migration are technologies that don’t implement new APIs or standards. These alternative options sit atop your existing infrastructure and enhance the power and reach of your SCORM content. There is not much tweaking you would need to do to utilize the benefits of such offerings. Such offerings include offline players and plugins, dashboards for tracking learners of different LMSs and more efficient tracking mechanisms. This may sound similar to what Tin Can does and it should. The difference lies in the fact that such systems are supposed to work with SCORM, with minimal change to what is already up and running. An example of this alternative system is the e-Zest’s SCORM Offline Player. This offline player also comes equipped with visualization features and a combined, query-able record store. The SCORM Offline Player set of technologies support multiple platforms for the offline consumption of courses. They also feature a technical design done to support the download of a course, in a pause-resume format and track the regular SCORM learner offline. This solution has also successfully fit into many e-learning ecosystems and proved why technologies like these could be a better alternative to Tin Can. Such technologies are never in direct competition with SCORM or its functionalities. Hence there is no discussion around say e-Zest’s SCORM Offline Player versus SCORM. Such a discussion won’t make any sense to begin with as the objective for these technologies is always to support and enhance what SCORM already does. The changing paradigms in e-learning due to the advent of mobile and experiential, bite-sized learning is going to bring further innovation in these technologies and it will only foster better quality and design in e-learning technology.